"The secret ingredient which makes this cacciatore stand out is pancetta, an Italian bacon. Once a specialty deli item, it is now readily available at most major supermarkets. The pancetta gives the sauce richness and body. I've also found that fresh basil leaves and baby portobello mushrooms make it my own. It is kid-friendly and fills the house with a wonderful aroma." Heat the olive oil in a large nonstick skillet over medium heat, and cook and stir the pancetta until it begins to turn dark brown, 5 to 8 minutes. Remove the pancetta pieces from the skillet with a slotted spoon and set aside. Mix the flour, Italian seasoning, and red pepper flakes in a shallow bowl. Press the chicken thighs into the flour mixture, tapping off any loose flour. Brown the chicken thighs in the skillet with the oil and pancetta drippings, 8 to 10 minutes per side. Transfer the chicken thighs to a platter and keep warm. Cook and stir the green bell pepper, sweet onion, and portobello mushrooms in the same skillet until the onion turns translucent, about 8 minutes. Stir the basil, garlic, tomato paste, diced tomatoes with their juice, and red wine into the sauce. Bring the sauce to a boil, and return the chicken and pancetta to the sauce. If sauce does not almost cover the chicken pieces, mix in more dry red wine. Reduce heat to low, and simmer the chicken and sauce until the chicken thighs are tender and no longer pink inside, 35 to 50 minutes. If you prefer a thicker sauce, whisk cornstarch with water and 1 tablespoon of the sauce, and stir the mixture into the skillet until thickened. About 15 minutes before serving time, bring a large pot of lightly salted water and bring to a boil. Stir in the rigatoni and return to a boil. Cook uncovered over medium heat, stirring occasionally, until the pasta has cooked through but is still slightly firm, about 13 minutes; drain. To serve, transfer the cooked rigatoni to a large platter and top with the chicken thighs. Generously ladle sauce over the chicken and pasta, and sprinkle the dish with Parmesan cheese, salt, and black pepper. Serve any extra sauce on the side. 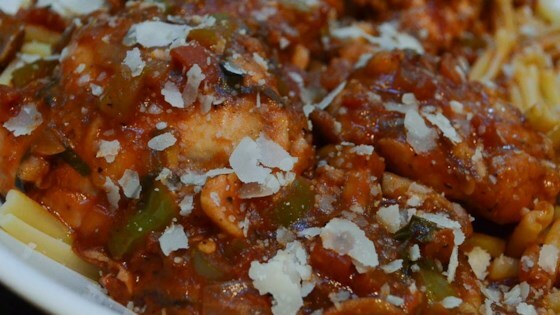 Favorite Italian chicken dish prepared in a slow cooker. serrved over butter /garlic herb noodles.Store bought KNORR noodles,olive oil, no bacon. s Side; colliflower. My picky husband loved it! I used chicken broth instead of wine and fresh chopped tomatoes. I only subbed for lack of wine and canned in the cupboard!